The most important challenge job seekers face today is conducting a strategic job search. 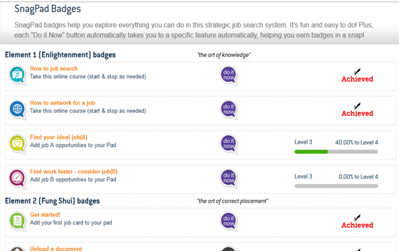 SnagPad's a tool that enables career professionals and the job seekers they support to learn about and manage job search activity in a visual and strategic way. Turn real-time job seeker activity into actionable information for faster, smarter practitioner assistance. Provide job seeker learning and strategy tools that are research based and lead to greater performance. Minimize gaps between face-to-face meetings, using real-time data accessed from your desktop. 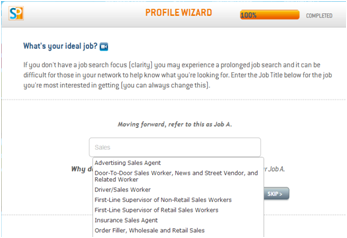 Job seekers turn job opportunities into intelligent job cards that they manage on their SnagPad. Organize & Manage job opportunities on your pad. Serve as a "virtual coach" - providing strategies, tips and assistance at each stage of the job search process. This strategy shows how SnagPad links a job seeker's Facebook and Linkedin accounts to reveal who they can reach in their network who is assoicated with a particular employer they are considering. With SnagPad you'll have all the information necessary to provide targeted support based on actual job seeker search activity. The job seeker enters the data, which you use to help them. What could be more simple? 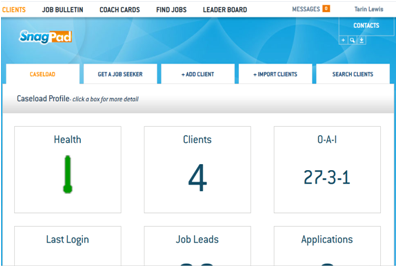 SnagPad increases engagement and communication between coach and job seeker through notes, messaging and chat. Coaches can be proactive by viewing actual job search data and by receiving system generated notifications and reminders. Coaching job seekers when they are in front of you is easy – but what happens when they are on their own? What are they doing and does it align with your direction and advice? 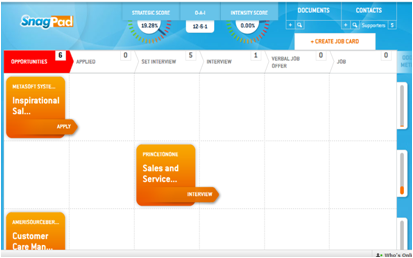 No other tool provides such insight to "See" all of their client’s job search activity.